The Internet is here for travel – now small travel. Travel was the first industry to really exploit ecommerce. Through out the roller coaster economic times of the past decade – people still travel. As travel has evolved so has the variety and quality of services at each destination people flock to. Sport fishing & Adventure Tourism all have one thing in common. They for the most par small businesses run by hard working me and women, they exist all over the world and the life blood of their businesses is increasingly originating from the Internet. 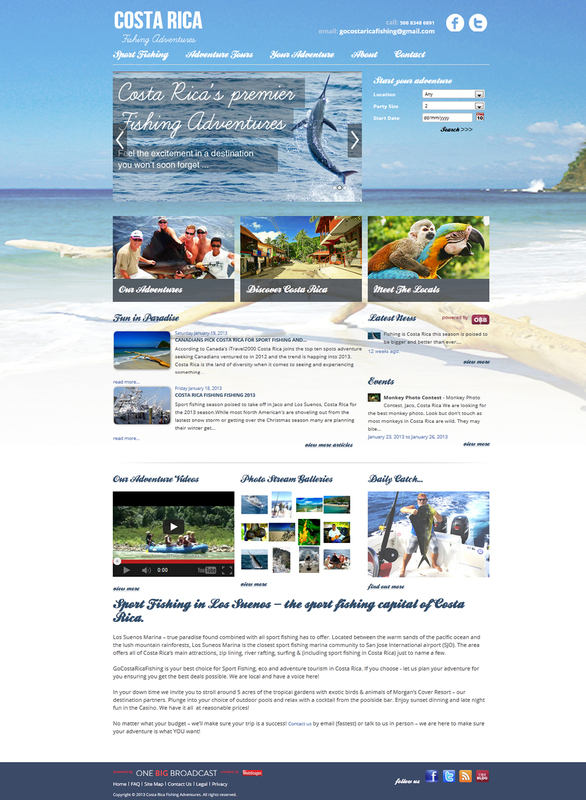 Fueled by innovation and built with a sense of adventure, GoCostaRicaFishing.com was created with power in mind. Since we know we have an awesome content marketing platform capable of powering clients sites to the top of search, then building a member platform and harnessing social ecommerce would be the next logical step. Forged in the labs of OneBigBroadcast, our social ecommerce platform melds the various tools and platform capabilities together. A member platform that allows any sport fishing operator, vacation home or adventure tour owner to harness the same power our clients have using our social integration tools, social SEO and now selling via an integrated platform. Although the platform is scalable globally, each member can update their own detailed profile, images, blogs and IMGY galleries as if they are in their local area while competing globally. This powerful technology platform is modular in design and components are being utilized to build the sports event social broadcast community for the Young Olympians event (www.YO.ca) sponsored by the Canadian Legion and Sport Canada. For more information on this platform and how this platform could enhance your own business - big or small contact us.